Who Is Starwood Preferred Guest Good For? Starwood Preferred Guest (SPG) is much more than it seems. On the surface, it looks like a simple hotel program, not much different than the reward program run by other industry heavyweights like Hyatt, Hilton or Marriott. But Starwood’s currency, Starpoints, actually unlocks a world of travel far beyond hotels. Along with Chase Ultimate Rewards, Starwood Preferred Guest is one of the most powerful point-to-mile transfer programs around. That’s why, if your credit is good enough, the Starwood Preferred Guest American Express is absolutely one of the first reward credit cards you should look into getting. The sign-on bonuses on SPG credit cards are always comparatively low. But that’s the deceptive part. Starpoints can be some of the most valuable points around, with a value of up to 2.5 cents per point, depending on how they are redeemed. How Can You Use Starwood Preferred Guest Starpoints? Starpoints have their highest value when you redeem them directly for hotels (usually around 2.3 cents per point). But they have above-average value when redeemed for travel as well. When you transfer Starpoints to most airline frequent flyer program partners, you get a 25 percent bump on your points, as long as you transfer in 20,000 points increments. If you transfer 30,000 points, you’ll still only get a 5,000 point bonus, so it’s worth it to transfer in 20,000 increments. 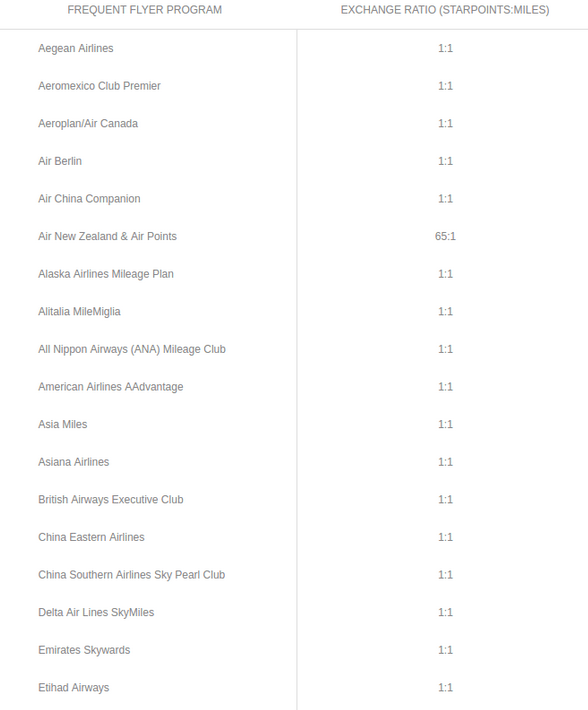 You must have a frequent flyer membership with the carrier you want to transfer to, but Starpoints are a great way to accrue points on global carriers that have great redemption rates. If you can’t find a good flight on a partner airline, you also have the option to book travel directly through the Starwood Preferred Guest program. However, instead of a fixed cents-per-point redemption, you pay per price range: 10,000 Starpoints for a flight up to $150, 15,000 points for a flight between $150 and $250, etc. For inexpensive flights where it’s not worth it to pay with miles in a partner airline, it’s not a bad deal. When you use Starpoints to book hotel nights, you also have the option to pay with cash + points. With some programs (cough, cough, the new Delta 2015 program), this option doesn’t actually save you money, but Starwood gives you some decent options. But the best choice is often Nights & Flights, which gets you a points’ transfer to an airline program and hotel nights for a fixed number of Starpoints. As discussed above, booking hotel nights can provide one of the highest-value uses of Starpoints, but it takes some research and savvy to make those redemptions. And somehow, you still have to get where you’re going. Thankfully, SPG offers a great option that takes care of both. Nights + Flights redemptions come in two flavors: 60,000 Starpoints for 50,000 airline miles and five nights at a category three hotel (typically Sheraton, Four Points or Westin) or 70,000 Starpoints for the same number of airline miles and nights, but category four hotels (typically W and Westin, with some Sheratons in top destinations). Category three hotels usually run 7,000 points and category four hotels usually costs 10,000 points, so you’re saving 15,000 points and 20,000 points respectively since you would get 10,000 airline miles free for transferring 40,000 Starpoints. These two deals greatly increase the value of your already valuable Starpoints. While Starpoints transfer well to most programs, United transfers have taken a huge hit as a result of United’s partnership with Chase Ultimate Rewards. 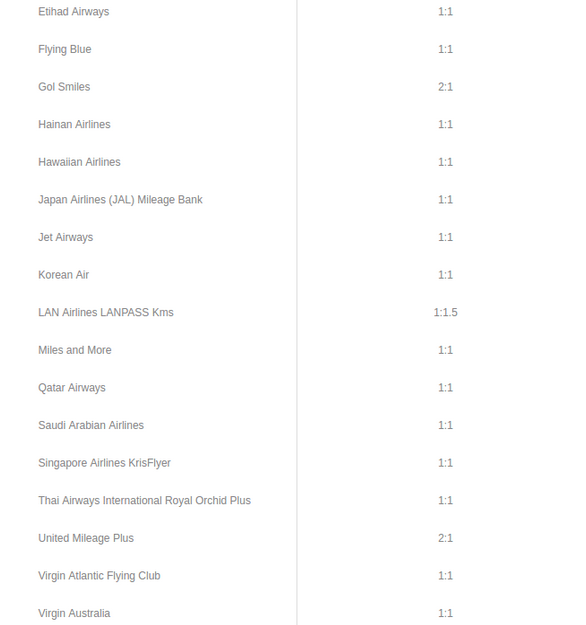 Transfers to the other major domestic airlines give you a 1.25 cents per point value so don’t transfer to United, because if you do you will be bummed when you realize those Starpoints don’t cover the United miles needed. At present, there are only two cards that fuel the SPG program: the Starwood Preferred Guest Card and the Starwood Preferred Guest Business Credit Card from American Express. They come with significant sign-on bonuses that look generous in comparison to its competitors (75,000 Starpoints and 100,000 Starpoints accordingly).